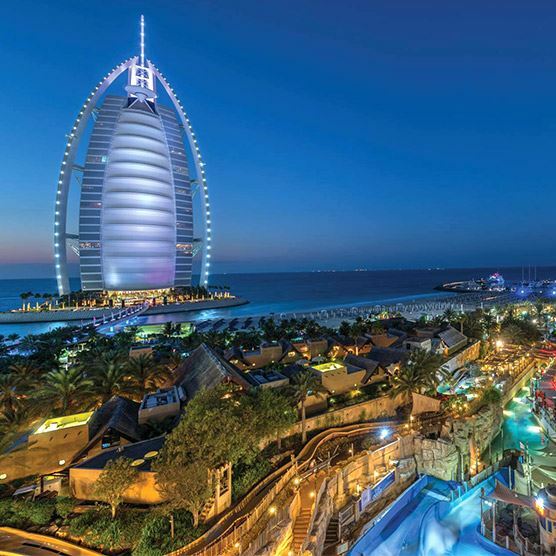 It's no surprise that Dubai boasts a few outstanding waterparks and plunge pools but Dubai also hosts the world’s biggest inflatable waterpark in the world, Aqua Fun waterpark at the Jumeirah Beach residence waterfront. The waterpark features an obstacle course with ramps, slides and wiggle bridges with a capacity of 300 people. A ticket costs around £32, which expires when you return to the shore. So, who’s ready to jump? Wild Wadi at Jumeirah Beach Hotel and Aquaventure at Atlantis Dubai also offer a plethora of exhilarating rides. Aquaventure's Shark Attack tunnel that zips through a pool of real sharks will give even the most gung-ho grown-ups a fun fright. Both waterparks offer shaded areas for little ones, sun loungers and snack bars, and lazy rivers and small pools for little kids and tots. What could be more fun than a mini city for little ones run by kids! Kidzania is a mini city located within the world's biggest shopping centre, the Dubai Mall. The play centre offers kids the chance to pretend to be adults for a day and try out all sorts of jobs and vocations - they can decide to be anything from a fire engine driver and a police officer, to a journalist or a beautician. Meanwhile, parents can unwind in the KidZania café or explore the shops outside. How do you fancy flying to a desert city and going skiing? Yep, that's right — Ski Dubai is the first snow dome in the country and we're crazy about it! Experience the Arctic winter in this huge 'ski dome’, and take your little sports enthusiasts skiing, snowboarding and tobogganing or zoom through the snow on fun-loving zorbing activities. Be sure to grab a snap of the snow penguins that now live there too. Skiing lessons are open to kids from three years and over, but if you want to breeze through the slopes on a board, kids must be at least eight years old. Before you leave, make sure you grab a bite at the Avalanche café. Take a 20-minute drive from Downtown Dubai and you'll hit the Arabian Desert, one of the original tourist attractions in Dubai. There are lots of excursions on offer but our favourite is a stay overnight under the stars in the lux desert camps. A 4x4 will pick you and your family up from your hotel and drive you out into the heart of the Dubailand. Beware, it can be a little bumpy as you drive over the dunes until you reach the Bedouin-style camp. Once at the camp, you can indulge in a traditional barbecue and salad buffet, belly dancing class and various other desert-related activities, such as sandboarding and star-gazing. Whether you're after delectable dining with a view or a tasty traditional meal that will please the whole family, Dubai has a vibrant restaurant scene that's sure to suit you. At the top of the pile comes the Bookmunch Café, where the adult and kids' books are just as tempting as the European dishes on the menu. There are a few Dutch-owned More cafés around the city that offer wonderful acoustics and dozens of hearty dishes on the menu. And, don’t miss out Café Ceramique that serves up cups and bowls for your little ones to paint and decorate.